My Garage Door Keeps Going Up and Down, What Should I Do? Keeping your garage in great condition should be your number one priority if you are like me and work and relax while tinkering in the shop. Your garage door is a big part of that and should be in perfect operation at all times. Are you having difficulty with your garage door? Can’t seem to get it to stay closed? It may be a straightforward problem that you can fix in less than a minute. The garage door goes down then back up. Your garage door opens immediately after closing. The garage door keeps going up and down. Your garage door opens when it hits the ground. Garage door opener keeps going back up. It may be your garage door sensor. There are four common problems with garage door sensors, three of these homeowners can fix themselves. Is your garage door safety sensor blocked? There is a law requiring garage door installations to include a sensor. This sensor will protect you by not allowing the door to shut close if something is in the way. Your garage door sensor works by having two photo-sensitive devices on either side of the garage door. If these can’t “see” each other when the door is almost shut, it will send a signal to the garage door motor to open back up. Sometimes the sensors will be in alignment and just as the door gets close to being shut it will vibrate enough to push one sensor off. 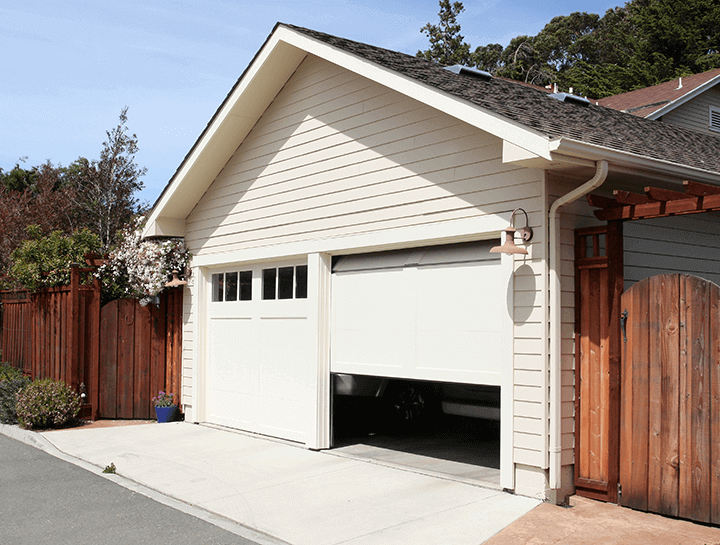 Is your garage door safety sensor off-track? Sometimes while moving stuff around in the garage, like the trash can, you may bump the sensor. The bump won’t be enough to knock it completely off the track but just enough to be out of kilter. When you look at your sensor, it appears to be in the right spot. Try to gently push the sensor with your hand to see if it moves. If so, try to see if you can snap it back into place on its track. Having an off-track sensor can cause your garage door not to shut at all, or it can cause it to close intermittently. This issue happens less often than a blocked or off-track sensor. There may be another sensor near the motor that tells the unit how far to let the garage door go down. If this is set too short, your garage door may not shut all the way, or it may slam hard on the ground and go back up. Look for two screws on the motor base. One will identify downward and one upward. One turn should equal about two inches of door travel either way. If your garage door “bounces” off the ground you will need to adjust the downward screw by turning it the direction that decreases it. Some garage door openers have these screws behind the lens that protect the light bulb so if you don’t see it on the side look there. The following video shows the limit adjusters and how to set them correctly. You may have a damaged safety sensor or cut wire. If nothing is blocking your sensor and it is lined up correctly, you may have a defective sensor or a cut wire. If you have a broken sensor or the wire from the sensor is cut or frayed you will need to get it repaired by a professional. You may have to leave your garage door open until you can get it repaired. I do NOT recommend using the manual release cord to lower your garage door. Your garage door is extremely heavy and can hurt or kill you if you try to lower it by yourself. Some easy maintenance todos will keep your garage door operating for many years. Keep the chains and tracks lubricated. Use a specialty spray lubrication on your garage door tracks and chains so the motor will have an easier time pulling the door up. Your garage door will open and close hundreds of times every year. All those ups and downs will vibrate and loosen some parts. Check all your bolts and brackets and tighten where needed. Does the weatherstripping need to be replaced? There is a rubber seal along the bottom of your garage door. This seal helps keep water out of your garage. Replace the weatherstripping if it is broken or chipped. This should be checked regularly. Garage door problems like these are fairly common, and thankfully sometimes easy to fix. Just last year my wife called and told me “the garage door keeps going up and down”. I was able to walk her through the step of straightening a sensor. Seems the kids got a little too rowdy with the soccer ball! I hope this article was able to help you get your garage door back “on track”.